JNN 20 June 2015 Damascus : The Syrian army forces surprised the terrorists and their supporters by regaining control of two important districts in Aleppo city, inflicting heavy damages and casualties on the terrorists. “The Syrian army forces staged preplanned operations in the Northern Reef (countryside) of Aleppo and managed to free the buildings and complexes in the Northwestern part of Bashkoi region,” a Syrian military source said on Saturday. During the operations, the Syrian army units heavily attacked the terrorists hiding in these buildings and wounded, killed and held captive a large number of them, the source said. The Syrian military source also said that another region in Aleppo named Afghans district was also cleansed of terrorist elements by the army, adding that these victories were achieved as some news websites had claimed the terrorists’ upper hand in Aleppo. Reports from Northern Syria said on Friday that the Army pushed back terrorists’ massive attacks on its line of defense in Aleppo city and inflicted heavy casualty on the terrorists in the last four days. The coalition of terrorist groups called ‘Fath Halab’ (Aleppo Conquest) has intensified its attacks over past four days on the city to break the army’s line of defense, specially in the Western parts of Aleppo over past four days. Fath Halab started its attacks on Al-Ashrafiya, Al-Khalediya, Al-Sabil and al-Zahra districts in Western Aleppo on Monday. On Tuesday, the Syrian army intensified its offensives in Aleppo after the terrorist groups launched mortar attacks on the Western parts of the city. The army’s intensified attacks came after the terrorists hit the government-controlled residential areas in Aleppo city. However, the Syrian army prevented the terrorists to make any advancement in the areas under its control in Western Aleppo. The terrorists started heavy attacks against the Syrian army positions in Aleppo with the intelligence, logistic and arms supports that could have been provided only by their regional allies, an independent source said. The four regions of Rashedeen, al-Khalediya, al-Ashrafiya and Bashkoy are the worst scene of the fierce clashes between the terrorists and the Syrian army. 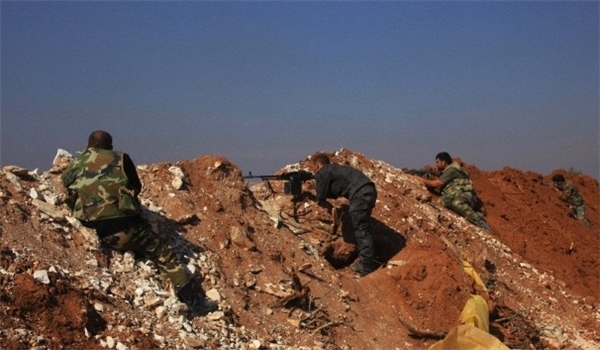 Tens of terrorists have been killed in the Syrian army artillery attacks and airstrikes on Rashedeen region and field reports said that the corpses of the dead terrorists are scattered on the ground for several hundreds of meters in this area. This entry was posted in Middle East and tagged Aleppo, Aleppo city, ISIL, ISIS, Re Capture, Syria, Syrian Army, Syrian military source, Terrorists. Bookmark the permalink. ALHAMDOLILLAH , MASHA ALLAH , I DO WAIT FOR THE DAY , MAY ALLAH BATASDADDUQ MAULA ALI ALAIHISSAM BRING THAT DAY CLOSER THAN TOMORROW THAT I HEAR FROM YOUR NEWS THAT THE ENTIRE SYRIA HAS BEEN GET RID OF THOSE TAKFIRI KAAFERRAN AND THE ENTIRE IRAQ AND SYRIA IS FREE FROM INFIDEL WAHABI SALAFI PRESENCE ,THAT MEN OF ABU BAKAR BAGHADADI WHOM I BELIEVE ALREADY HAS BEEN WASIL E JAHANNUM CANOT BE FOUND ANYWHERE DEAD AND ALIVE . NOT ONLY MEN BUT ALL GOATS ARE SAFE NOW..